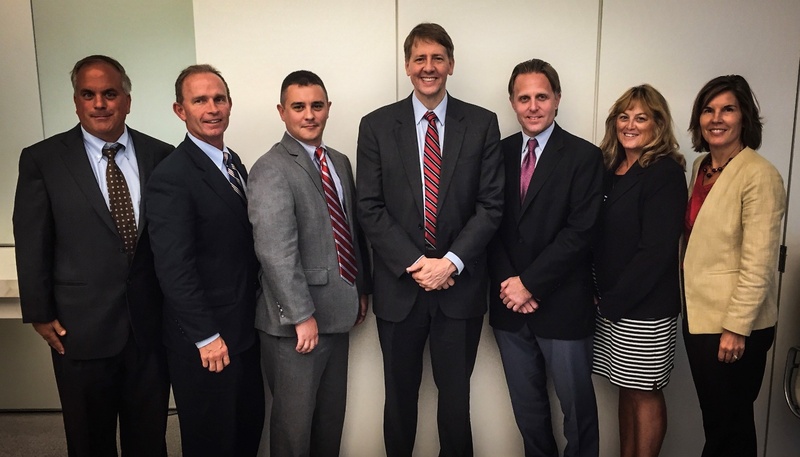 SACRAMENTO, Calif. – Members of the DBA International Board of Directors met today with Director Richard Cordray and senior staff of the Consumer Financial Protection Bureau (CFPB) to discuss mutual areas of concern and the upcoming rule making process. The meeting was part of DBA’s ongoing efforts to promote enhanced consumer protections for the benefit of both the consumer and business communities. This meeting was very informative and extremely well timed with the recently released proposed collection rules outline that was developed as part of the Small Business Regulatory Enforcement Fairness Act (SBREFA) hearing. DBA International was able to convey the important role its Receivables Management Certification Program has played in establishing best practices and setting rigorous standards in the accounts receivable management industry and expressed our appreciation that it was referenced several times throughout the SBREFA outline. The Director expressed his openness to continuing a “vigorous dialogue” and receiving feedback from DBA International throughout the rule development process. He mentioned several times during the meeting that he wants to prevent unintended consequences by failing to understand operational impacts of the rule on small and large businesses alike. The conversation on these points was very open and engaging and all parties appeared to leave the meeting with an enhanced understanding of the others perspectives. The CFPB expressed that they understand the more clarity they can provide in rules will allow the industry to proceed with their business operations with minimized risks. DBA International (DBA) is the non-profit trade association that represents more than 550 companies that purchase or support the purchase of performing and non-performing receivables on the secondary market. DBA’s Receivables Management Certification Program and its Code of Ethics set the “gold standard” within the receivables industry due to its rigorous uniform industry standards of best practices which focus on the protection of the consumer. DBA provides its members with extensive networking, educational, and business development opportunities in asset classes that span numerous industries. DBA continually sets the standard in the receivables management industry through its highly effective grassroots advocacy, conferences, committees, taskforces, publications, webinars, teleconferences, and breaking news alerts. Founded in 1997, DBA International is headquartered in Sacramento, California. Posted in Association News, Debt Buying .